The Great Recession, as it has come to be called, has impacted more people worldwide than any crisis since the Great Depression. Flawed government policy and unscrupulous personal and corporate behavior in the United States created the current financial meltdown, which was exported across the globe with devastating consequences. The crisis has sparked an essential debate about America's economic missteps, the soundness of this country's economy, and even the appropriate shape of a capitalist system. Few are more qualified to comment during this turbulent time than Joseph E. Stiglitz. Winner of the 2001 Nobel Prize in Economics, Stiglitz is "an insanely great economist, in ways you can't really appreciate unless you're deep into the field" (Paul Krugman, New York Times). 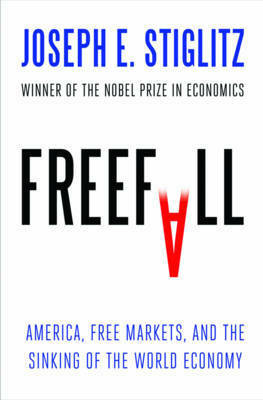 In Freefall, Stiglitz traces the origins of the Great Recession, eschewing easy answers and demolishing the contention that America needs more billion-dollar bailouts and free passes to those "too big to fail," while also outlining the alternatives and revealing that even now there are choices ahead that can make a difference. The system is broken, and we can only fix it by examining the underlying theories that have led us into this new "bubble capitalism." 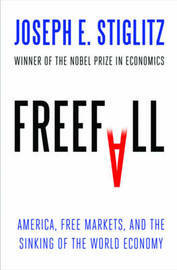 Ranging across a host of topics that bear on the crisis, Stiglitz argues convincingly for a restoration of the balance between government and markets. America as a nation faces huge challenges-in health care, energy, the environment, education, and manufacturing-and Stiglitz penetratingly addresses each in light of the newly emerging global economic order. An ongoing war of ideas over the most effective type of capitalist system, as well as a rebalancing of global economic power, is shaping that order. The battle may finally give the lie to theories of a "rational" market or to the view that America's global economic dominance is inevitable and unassailable. For anyone watching with indignation while a reckless Wall Street destroyed homes, educations, and jobs; while the government took half-steps hoping for a "just-enough" recovery; and while bankers fell all over themselves claiming not to have seen what was coming, then sought government bailouts while resisting regulation that would make future crises less likely, Freefall offers a clear accounting of why so many Americans feel disillusioned today and how we can realize a prosperous economy and a moral society for the future. Joseph E. Stiglitz is a Nobel Prize-winning economist and the best-selling author of The Price of Inequality, Freefall, and Globalization and Its Discontents. He is a columnist for the New York Times and Project Syndicate and has written for Vanity Fair, Politico, The Atlantic, and Harper's. He teaches at Columbia University and lives in New York City.